No. 8 in a series of posts on books I've bought but haven't got round to blogging about properly – indeed may never get round to blogging about properly – so this will have to do. 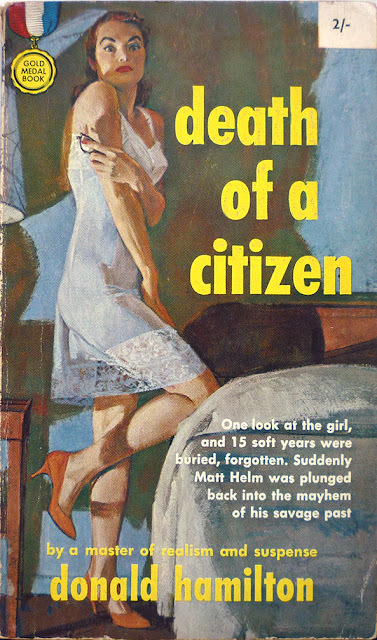 The first British edition of Donald Hamilton's debut Matt Helm spy novel Death of a Citizen, published in paperback by Frederick Muller – using plates supplied by Fawcett/Gold Medal – in 1960. There's no cover credit in the book, and the artwork is unsigned, but I would guess that it's by Bill Johnson, who also illustrated the cover of the fourth Matt Helm novel, The Silencers (1962), among many other Gold Medal titles. Leigh Gallery Books in Leigh-on-Sea, either last year or the year before. Well. 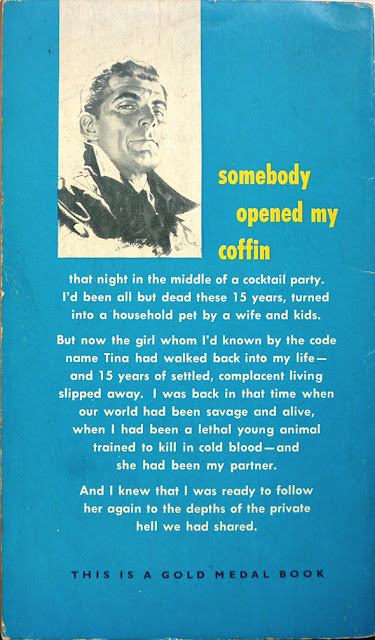 I already had in my possession first and second printings of the 1966 Coronet paperback edition of the novel when I bought this copy, so there's no excuse really. But this edition is the true British first – and almost identical to the true American first – and it was only three quid, so... No, it's inexcusable, isn't it? You know I always preferred Helm to Bond. That may be blasphemy to you, but I tend to think Hamilton was a better writer than Fleming. But that's just me. Both this book book and Casino Royal serve sort of as an origin story to there characters. They are the formative events in both Helm and Bonds life. They both end rather chilling. Citzen has Helm loose the family he loves; Bond the woman. My favorite of the Helm series, altho I didn't come to it until I'd read most of the others. Not sure why, except maybe it was out of print until the series caught its second wind. Now I feel like starting them over again!